Great!! I wait for Plexi 1959, they are same i think! Hey Alex, thnk you again for this one! 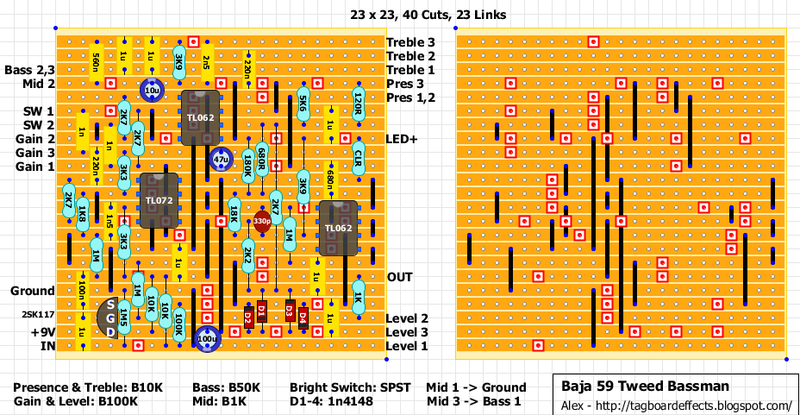 If possible, could you do Baja's "Dumble style" pedal circuit? How about the Deep Trip BOG. I want to thank all of this site for there work over the years. 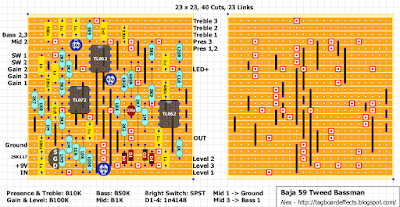 I have made a layout of the Marshall 1959 SLP and also the Dumble, but for some reason, I can't publish them. I have also mad a lot of other layouts of amps and pedals. Maybe put them in the forum. Hi! Can anyone tell me what function the transistor has in this build? Is it just the buffer? In that case it would´nt be a problem to use another than the 2sk117 which is very hard to get. It is a buffer. You can use other JFets but mind the pinout. "the input and output buffers are realised by 2SK117 N channel Jfets in this design - I am sure any small signal N channel jfet such as 2SK30, J201 or 2N5457 etc would work for these buffer stages." J201 and 2n5457 are getting scarce in through-hole, but the 2sk30 is available at Tayda. Leif where do you live, I can send you a 2SK117 if you like! Cool, much appreciated been waiting for this.